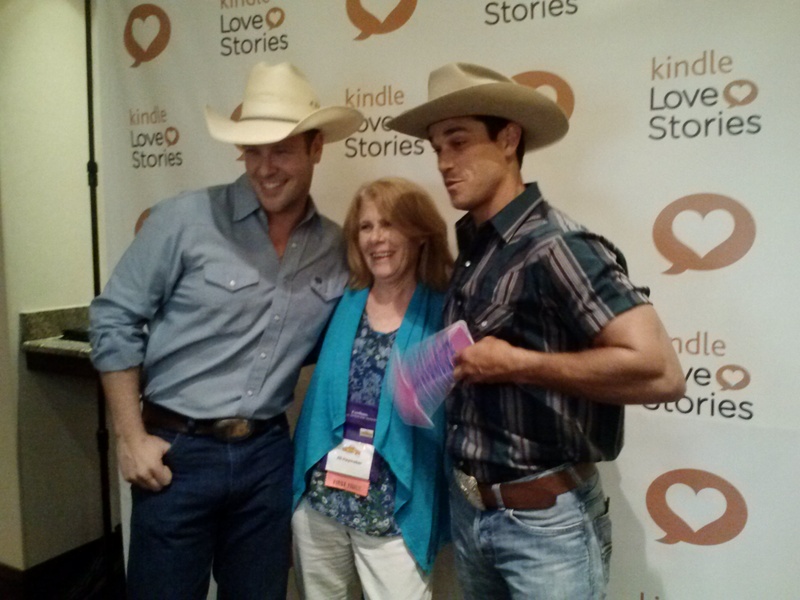 Well, I made it through and thoroughly enjoyed my first RWA conference. In fact, it was my very first writing conference, ever. For those of you who don’t write romances, this is the Romance Writers of America Conference, where a virtual nobody like me has the chance to meet talk with some of the leading romance authors in the world! I was totally thrilled to talk with my personal favorites- Robyn Carr, Jill Shalvis, and Nora Roberts. These ladies were all so gracious and put up with my gushing over them. I even have pictures to prove it. On top of all the best selling, big name authors, there were also hundreds of starting authors like myself, wandering around with our bright orange, first timer ribbons attached to our nametags. I attended so many great classes and heard amazing, inspiring women speak. It was a brain overload. What a wonderful experience to be surrounded by so many like minded people. I learned so much and came home so excited to keep writing. Along with bags and bags of autographed books. Should keep me in reading material for the next year. I also made some wonderful (hopefully lifetime) friends. All of this was set on the beautiful Riverwalk in San Antonio,Texas. It was hard to come back to real life this week, but I will never forget my experiences there. A great big thanks to all of the wonderful people I encountered. When it comes to my favorite days every year, I’ve got to say that 7-11 is one of them. For those of you who don’t know about this marvelous tradition, on July 11 every year 7-11 stores give out free Slurpees! What a great advertising idea. I always circle the date on my calendar so I don’t forget. Now you may ask, am I a big fan of this drink that consists of ice and sugary syrup? Not really, even though I used to take my kids on a regular basis when they were young and it was hot outside. In fact the last few years I think the only times I’ve actually had a Slurpee is on free Slurpee day. These days if a I want a frosty drink, I tend to gravitate towards Jamba Juice or Berry Blends, where your frosty treat has arguably some nutritional value. Or, of course my favorite is those Frappacinos at Starbucks. But back to Slurpees, on 7-11 every year, I hike down to the nearest 7-11 to my office (about 8 or 9 blocks) to get my free Slurpee. Its always hot in July and dressed in my work attire, I find myself sweating by the time I reach the store. My face lights up when I see those free Slurpee cups! Now, once again if you have never been, the free Slurpees are not the 7-11 big gulp size, not even the small 12 ounce size, nope they make miniature cups just for this event. (The past couple of years they have increased the size of these cups, now maybe 6 oz? complete with lids and straws. No doubt as the result of complaints by free Slurpee enthusiasts like myself!) Prior to that they were the maybe 3 to 4 ounce variety. Anyway, I get my Slurpee and manage to drink the whole thing about halfway back to my office, arriving back at my desk hot and thirsty again, but satisfied to know I got my free drink! I make sure to circle the date on my next year’s calendar so I wont miss my next chance. This year, I had a meeting out of the office, so didn’t make my usual trek, instead I realized that I hadn’t had my free Slurpee yet as I was heading home. I quickly turned my car toward the direction of the nearest 7-11, which required driving down a road that was under construction. As all the other motorist sat there, angry and hot, I smiled because I knew there was a Slurpee at the end. When I finally made it to the 7-11, it was just my luck to walk in behind, you’re not going to believe this, a whole daycare full of kids! And of course, each of the 20 little people had to make their own Slurpee, covering themselves and the nearby floor with sticky sweetness. (as I stood and patiently waited for my turn, I couldn’ t help but wonder what daycare worker in their right mind would load all of these small kids in their vans with sticky fingers and spillable sticky drinks?) I guess that’s just how cool free Slurpee day really is! 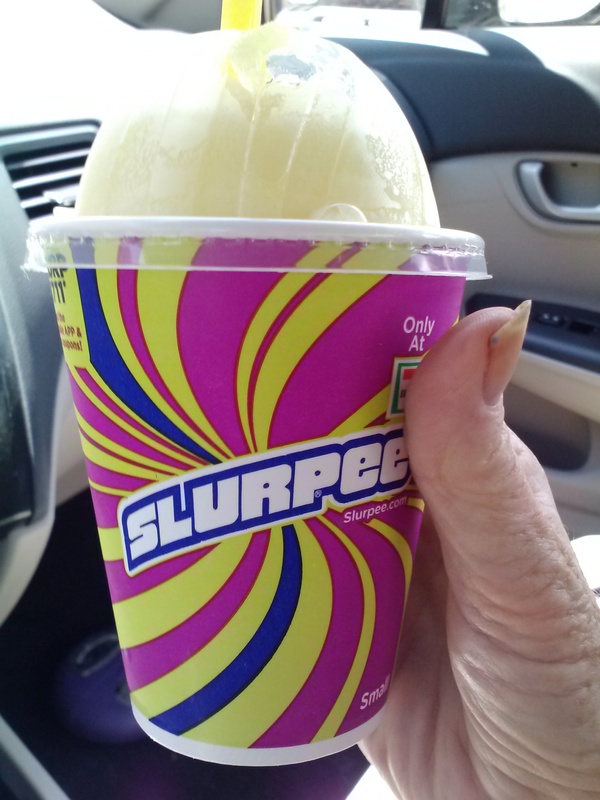 Anyway, after many minutes, I finally got my free Slurpee (picture above to prove it). Yep, that should hold me until next July!